Setting default or normal working hours for your staff is easy. Sometimes, staff will need a day off here and there, their hours extended and/or reduced, or perhaps they need to work a day they don't usually to cover a sick staff member. Any changes you make to a staff member's hours - from their staff profile or directly from the calendar - will be reflected in the Roster. Working with rotating or fortnightly roster. Rostering your staff at multiple. The roster can be viewed for a specific location, a month at a time. At the top of the page, you will be able to select a Location - only one can be viewed at a time. You can then select a Staff member, or choose All staff or Working staff only. You will then be required to select a Month and a Year. To view the roster for your particular selection, click Go. Disclaimer You will need to click the Save roster after making any changes to a specific month or location. Switching between months/locations won't automatically save any changes made. 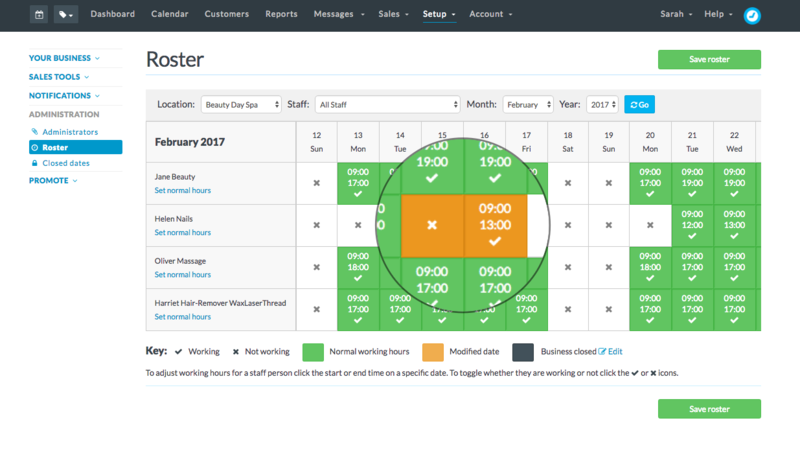 Each staff member's Normal working hours, shown in green, are automatically loaded into the easy to use table. 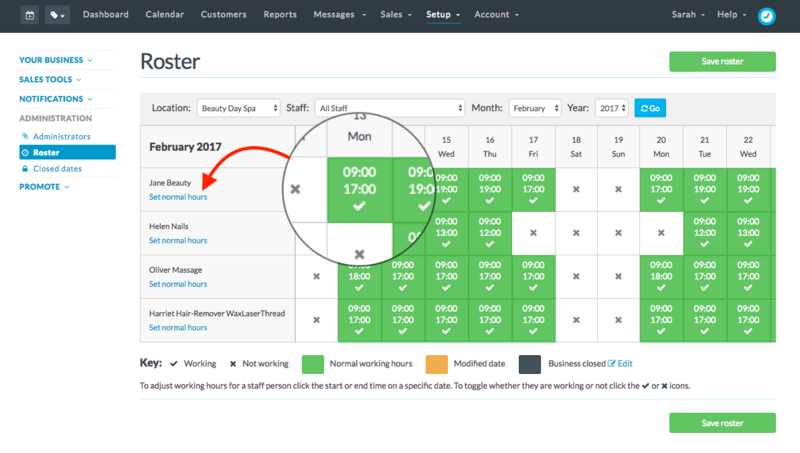 If a staff member is unavailable to be booked on a particular day, or has a change in hours on a specific day/week, you can adjust that individual day in the Roster. Click the [tick] to quickly roster that staff off for a day. Click the [x] to quickly roster a staff member on. The default hours for the location will be used. Note: If you are updating the roster for multiple staff, or across multiple dates, make sure to click Save roster before selecting another staff member, location or month from the options. It's only possible to assign one set of Normal working hours for a staff member. So if you have staff that work a rotating roster e.g. changes every week or fortnight, then you will need to modify those dates manually. We recommend setting the staff member's Normal working hours to one of the fortnight's hours, then you can use the Roster to modify the hours on the alternative weeks. At the moment, you can add one start time and one end time to each working day. If your staff work split-shifts or have extended breaks during the day the best way to manage this is to roster their start time at the beginning of the first shift and the end time when their second (or last) shift finishes. Then in the period during the day that they don't work you would add Busy Time to their calendar so they are unavailable. If they work this shift routinely, you can set the busy time to recur. For more information on adding busy time you can check out our article on busy time in the 'Related articles' section below. If your staff work at more than one of your available locations then you can easily roster them as such. They can even be rostered on for the same days and/or hours at two (or more) locations. 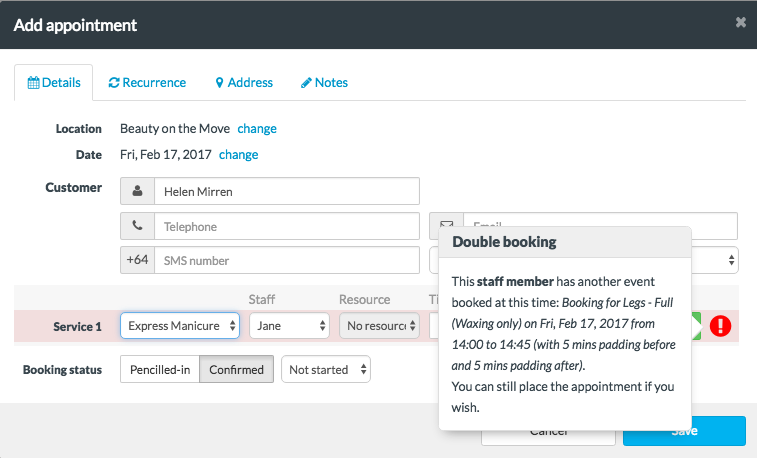 When an appointment, busy time or break is added to a staff member's calendar at one location then they won't be able to be booked online at any of the other locations.